Ingo is the first book in a major series for children, set in a tantalisingly beautiful and dangerous world of adventure under the sea, where the Mer people live. The second book in this trilogy, The Tide Knot, will be published in May 2006 at the same time as the paperback of Ingo. 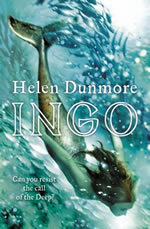 Ingo is also published by HarperCollins in the USA, and by HarperCollins Canada. Sapphire and her brother Conor live on the Cornish coast in a cottage on the cliff-tops. One day just after Midsummer Eve, their lives change for ever when their father disappears while out in his boat one evening. Everyone else thinks he has drowned, especially when his upturned boat, the Peggy Gordon, is found wedged between rocks at the foot of the cliffs a few miles down the coast. But Sapphire and Conor believe he is still alive, and they make a vow never to give up their search until they find him.